Samuel Kendall claimed he had a loaded gun and was going to shoot officers when they turned up. He made a string of nasty, foul-mouthed threats from a public phone box in Barnoldswick, as he banged his head against it. Kendall was caught as the kiosk was covered by CCTV. The defendant also vandalised two estate agents' shops in the town, putting the windows in with a large stone and plant pot, in the drunken "escapade" on the evening of October 15th. 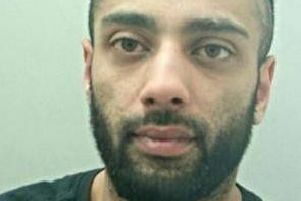 He had gone out to celebrate turning 27 that day, had been boozing since the afternoon and could remember nothing about the trouble, the hearing at Burnley Magistrates' Court was told. A judge heard Kendall, who has drink and drugs issues, had "got extremely wound up" after he went round to his former partner's home. He wanted birthday cards that had been delivered there for him, some of which contained cash, so he could carry on drinking. The hour-long outburst almost landed the defendant behind bars, after Deputy District Judge Michael Hopkinson said he had seriously considered sending him to prison. The deputy district judge said the phone call was a "particularly unpleasant offence," as Kendall had been highly abusive and caused considerable distress. Prosecutor Mrs Philippa White told the court Kendall called the emergency services and made threats about his former partner. Mrs White said the defendant continued: "I'm going to kill you. Honest to God, I'm going to murder you. I have a gun. I'm going to shoot you when you get here." A noise was then made and Kendall threatened: "Hear that? Loaded. That's a gun. Get the police to me now. I'm going to smash them. I will stab you." He then put the phone down. The prosecutor said Kendall was identified from the CCTV footage and later arrested when a taser was trained upon him as he climbed a wall. Mr Glen Smith (defending) told the hearing Kendall had been out drinking with friends and went to his ex-partner's. The solicitor added: "She dismissed him. She wouldn't let him have his belongings and there was a confrontation. He was extremely agitated and frustrated." The solicitor, who described Kendall's behaviour as "concerning and worrying," said the defendant was now attending Alcoholics Anonymous and Narcotics Anonymous. Kendall, of Mosley Street, Barnoldswick, admitted causing to be sent by public communication network a false message to cause annoyance/ anxiety/inconvenience and two counts of criminal damage, each to the tune of £500, at Taylorths and Pad 2 Let estate agents' properties. The defendant, currently on employment and support allowance, was given a 12-month community order with an alcohol treatment requirement and a 12-day rehabilitation activity requirement.